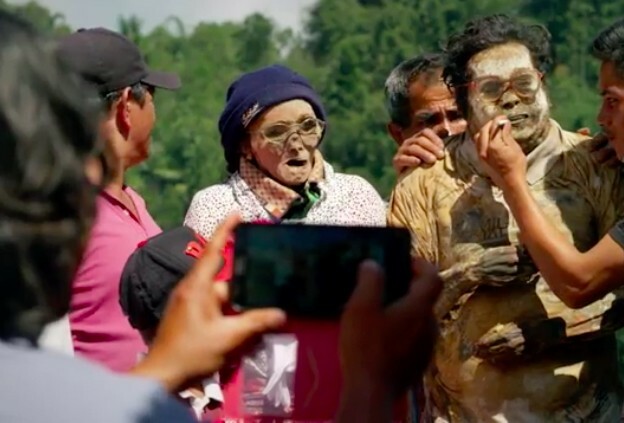 In the mountains of the Indonesia island of Sulawesi lives a tribe who have a totally different approach to death than most people on this planet. In the ritual of Man’ene relatives dig up their dead relatives, clean them, take selfies with them and then return them to their coffins. It is a hot sticky sunny day, as it often is here. A village elder walks towards a tomb – opening the entrance and pulls out a cylindrical red coffin with the help of his friends. 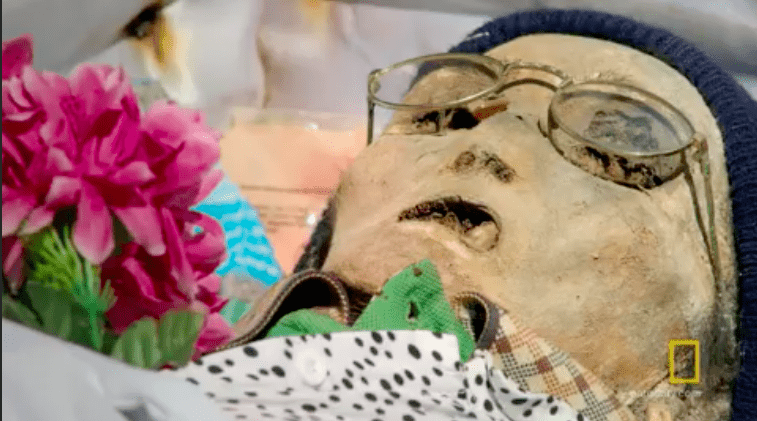 He opens the coffin to reveal the mummified corpse of his mother. Relatives gather round and look lovingly on as Mama Kristina stares blankly back at them. Mama Kristina is removed from her coffin and lovingly cleaned and re-dressed in new fresh clean clothes. Her son holds his mother’s mummified corpse upright and shuffles her round so she can look at the view over the rice fields. He mutters lovingly to her as he does this. She’s propped up by the family home so her family can connect with her again. They pose next to her – taking pictures with their smart phones to post on Facebook. A second coffin is opened and a mummy moved out. It’s an uncle. They remove him dust him down pop a smoking cigarette in his mouth and pose next to him taking selfies. After their time in our world the mummified corpses are tenderly laid back in their coffins.Money and cigarettes are placed next to them. Then lid is closed and they are retuned to their resting place. The occasion is a mixture of joy and sadness. There is laughter there are tears all bathed in great affection and tenderness. It can be shocking and hard to watch but this occasion is at the heart of the Torajan’s belief system. Torajans don’t shy away from death as many in the West do, they hold it central to their lives.For the Torajan’s death isn’t the end. For them there is no hard distinction between the living and the dead. It is a gradual continuum – a veil not a brick wall. When they have raised enough money they finally bury them in a lavish funeral that can go on for a week. You can watch this ritual on the National Geographic series One Strange Rock.